Breeze is the only entrant in the 1m2½f maiden for three-year-old fillies at Dundalk tomorrow (8pm) who is making her debut, but what she lacks in experience she makes up for in pedigree appeal. The Fozzy Stack-trained filly is by Sea The Stars, the world champion racehorse of 2009 and an excellent young sire whose 34 stakes-winning offspring are headed by Derby hero Harzand and Oaks scorer Taghrooda. Bred by Barronstown Stud, she is out of Kitty Matcham, who won the Group 2 Rockfel Stakes in 2007 and has produced three winners from three runners, though none has gained black type. Kitty Matcham was the result of Imagine, the brilliant winner of the Irish 1,000 Guineas and Oaks in 2001, being sent to Rock Of Gibraltar, who famously landed seven Group 1 races in a row at two to three in 2001 and 2002 including the Newmarket and Curragh 2,000 Guineas. Imagine has been a fine broodmare, having also produced the ill-fated Prix Jean-Luc Lagardere winner Horatio Nelson; Group 2 winner Viscount Nelson, who was also third in the Irish 2,000 Guineas and Eclipse; US Grade 3 winner Point Piper; and Irish Champion Stakes and Tattersalls Gold Cup third Red Rock Canyon. Imagine is in turn a half-sister to the brilliant Derby winner Generous, Grade 3 winner Wedding Bouquet, Irish 1,000 Guineas runner-up Strawberry Roan and stakes scorers Osumi Tycoon and Windy Triple K.
Breeze races for Peter Vela and Susan Magnier after being bought by BBA Ireland for 525,000gns at Book 1 of the Tattersalls October Yearling Sale. 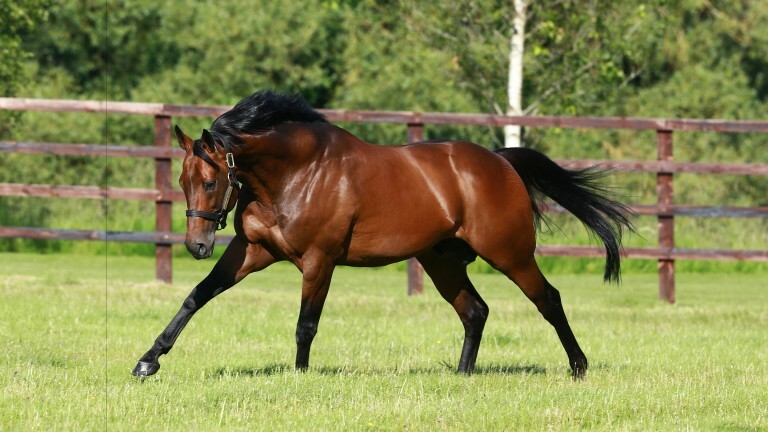 Two of her rivals at Dundalk have particularly attractive pedigrees and both are by Sea The Stars' half-brother and fellow Derby winner, Galileo. Key To My Heart, who has failed to get off the mark in five starts but has blinkers applied for the first time, is a 1,300,000gns Book 1 purchase by Coolmore out of A Z Warrior, a daughter of Bernardini who won the Grade 1 Frizette Stakes at two. Puppetshow, making her third start, is a half-sister to Norfolk Stakes second Coach House out of Lesson In Humility, a Group 3 winner who was third in the Prix Maurice de Gheest and Golden Jubilee Stakes. The latest three-year-old by Frankel to have the wraps taken off them is the colt Tango Fire, down to make his debut in a 1m½f three-year-old maiden at Nottingham (1.50pm) on Tuesday. The Richard Hannon-trained Tango Fire is out of the Danehill Dancer mare Latin Love, a dual Listed winner over 1m-1m1f and runner-up in the Grade 2 Canadian Stakes at Woodbine. Latin Love is out of a half-sister to Irish Oaks heroine Moonstone – the dam of last year's Derby second US Army Ranger – and to Irish Oaks and Breeders' Cup Filly & Mare Turf second L'Ancresse and EP Taylor Stakes second Cerulean Sky. Tango Fire will carry the silks of Mohammed Sultan after being bought by Rabbah Bloodstock for 130,000gns from the draft of breeder Newsells Park Stud at Tattersalls October Book 1. He is one of potentially four runners by Frankel across Britain and Ireland on Tuesday. Wishing Time, a daughter of Group 3-winning sprinter Beyond Desire, bids to break her duck at the fourth try in a Class 6 handicap over 5f at Catterick (2pm). Monarchs Glen, a son of Grade 3 winner Mirabilis and off the mark at Goodwood in October, goes for a second victory in a 1m3f handicap at Kempton (6.45pm). San Remo, a half-brother to Group/Grade 1 winners Dubawi Heights and Make Believe, could win at the fourth attempt in a 1m2½f handicap at Dundalk (8.30pm).